In the introductory chapter, Molefe gives the reader an overview of the philosophical issues central to his book. His focus is the normative idea of personhood in African philosophy; his aim in this work is to draw out the implications of personhood for moral and political theory. 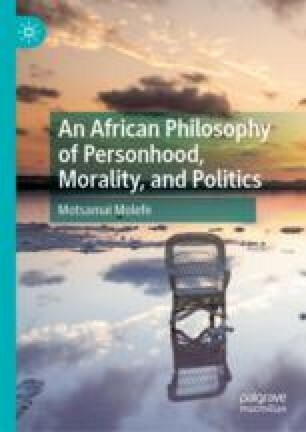 The introduction is divided into three sections: In the first, Molefe discusses four concepts of personhood in African philosophy, singling out an agent-centred notion as central to his analysis. The second section examines recent debates regarding personhood in the philosophical literature. Molefe’s aim here is to bring to light under-explored facets of morality and politics. The moral discussion focuses on moral concepts such as options and the meta-ethical debate between partial and impartiality. The political enquiry focuses on the ideas of dignity, rights, and historical injustices. The chapter concludes with an overview of the book.